Ivan Mohorič, a local author, indicated in his book V zvezdi piše vse (Eng. Everything is Written in the Star) that the pentagram appears through our entire history. He lists one example after another from the mysteries of the world still unexplored today. It is an interesting read, but already in advance it opens up more questions than it gives answers. Whoever walked the villages of the Cerkno region knows that the struggle for the daily bread there was hard in the past. The diverse landscape is the reason for poor and steep roads, which also influenced migration and trade. A special point of interest is definitely the old churches, which can be found in every village. What especially attracts the attention of visitors is that the churches are not placed in the middle of the village as it would be logical, but are in some places right in the middle of fields or meadows far away from houses. What is the reason behind this? 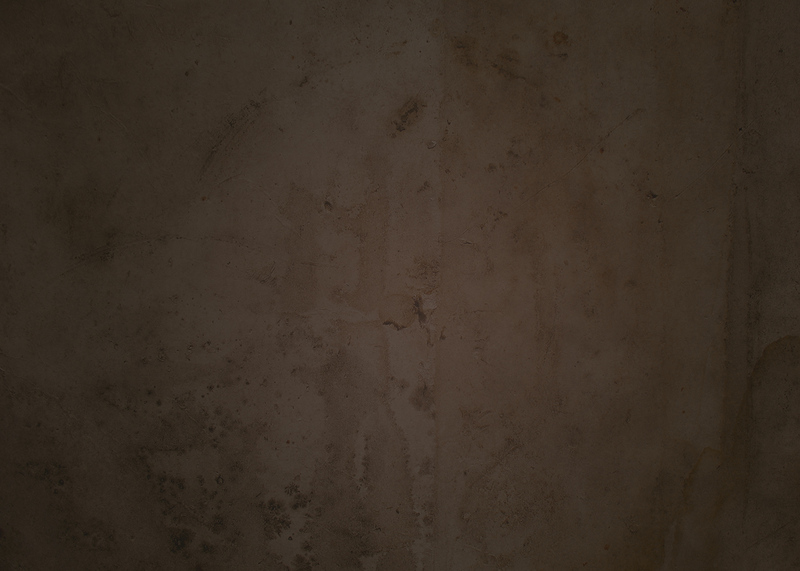 The locals say that an image of a saint had been appearing in that spot or that by building the church they merely fulfilled the saint’s wish or that people started building a church elsewhere, but everything fell apart during the night and the building material kept moving to this spot in a miraculous manner. Based on this, we can conclude that the church has to stand precisely in that place. Ivan Mohorič wrote that in connection with others it forms a “divine signature”, which at the same time also stores information about something that is hidden. We can see the signature only by looking at things in a complex manner, but will we also find the hiding place? and the spot height 553 at the Roglca summit. Even Roglca is not a coincidence. 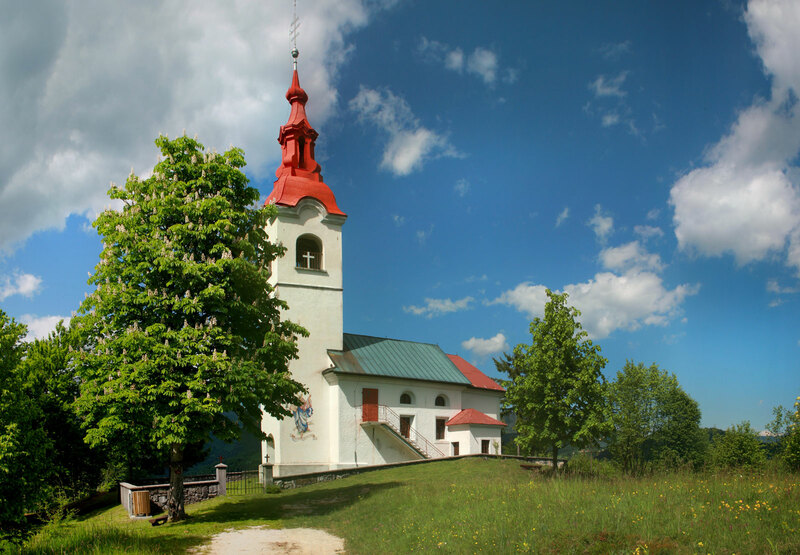 If we draw a line from the end of the side marked by the Church of St. John the Baptist to Roglca and onwards, we reach the Church of St. Ulrich in the village of Gorenje Ravne and, vice versa, if we draw a line from the opposite end of the side marked by the Church of St. John the Baptist, i.e. 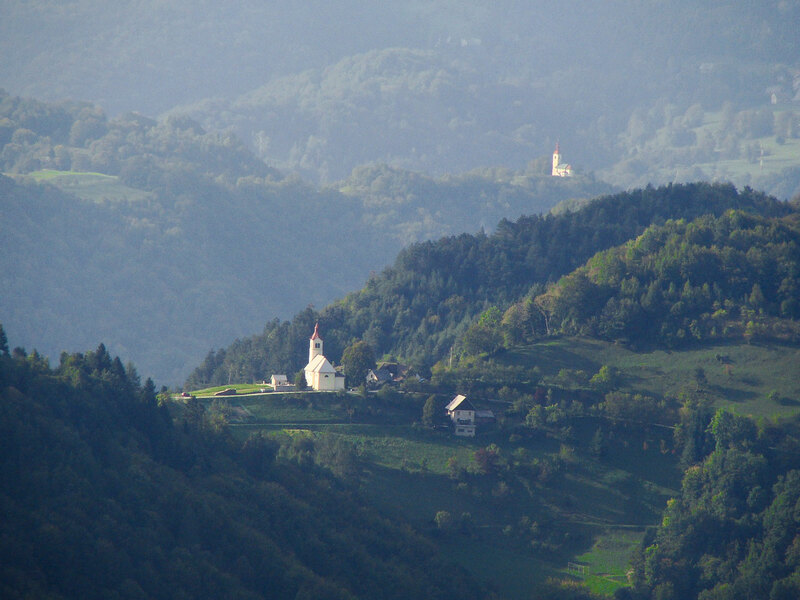 from the Church of St. Paul in Želin towards Roglca and on, the line stops at the Church of St. Leonard in Bukovo. When we look at a map we can see that we have drawn an almost perfect pentagram. The “error” in the angle is barely three degrees. It is interesting how the outside churches mark the bisectors of the star and the lines deviating from them by three degrees. 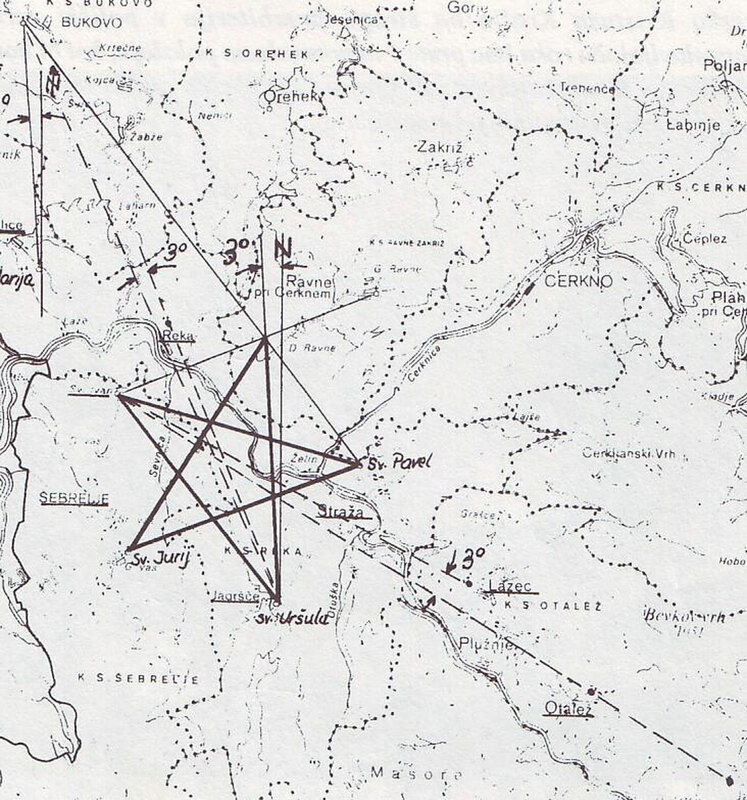 The angle of three degrees is marked by the Church of St. Cantianus in Reka – the Church of St. Catherine in Otalež marks the bisector line of the star which goes from the Church of St. John the Baptist in Šebrelje to the Church of St. Nicholas in Jazne – the Church of St. Leonard in Bukovo and the Church of St. Mary in Police. What is the truth and what is the shape of the pentagram in nature marked by the houses of God trying to tell us? Undoubtedly, the churches are placed away from the village, because they need to be in the right relation to the other ones. We can’t be certain if all the churches replaced the previous pagan temples and we can only speculate, but it’s certain that the Gothic Church of St. John the Baptist in Šebrelje at the northernmost part of the plateau stands in the place where a pagan Sun temple once stood. The feast day of John the Baptist (Slov. Janez Krstnik) falls precisely on the summer solstice overlapping the previous deity called Kresnik. Proof of this is also the inscription in the blue field above the main altar painting: JANES KRESNIK (Kresnik instead of Krstnik). There are some claims that the small Church of St. John the Baptist was built in the year 1152. It was demolished in 1763 by order of Emperor Joseph II. After more than 100 years the locals renovated it completely and inscribed the year of renovation 1870 above the entrance door. Preserved is also the plea of the mayor and the priest asking the locals to donate money since the costs of renovation were considerable. In the plea they also wrote that there were many bad harvests ever since the small church had been demolished and that strange lights were seen above the shrine many times. The hypothesis that pagan temples stood in the other places as well is also supported by human settlement in the area since it goes back long before the arrival of Christianity in the local villages. The karstic plateau on which the village of Šebrelje is located is a natural fortress so to speak. It’s not unknown that people living in the time of hillforts but also before chose an easily defendable and hardly accessible area for their settlements. The other villages – Jagršče, Roglca, Police, Bukovo – are also located high above the Idrijca river, on a natural shelf, ridge or plateau. 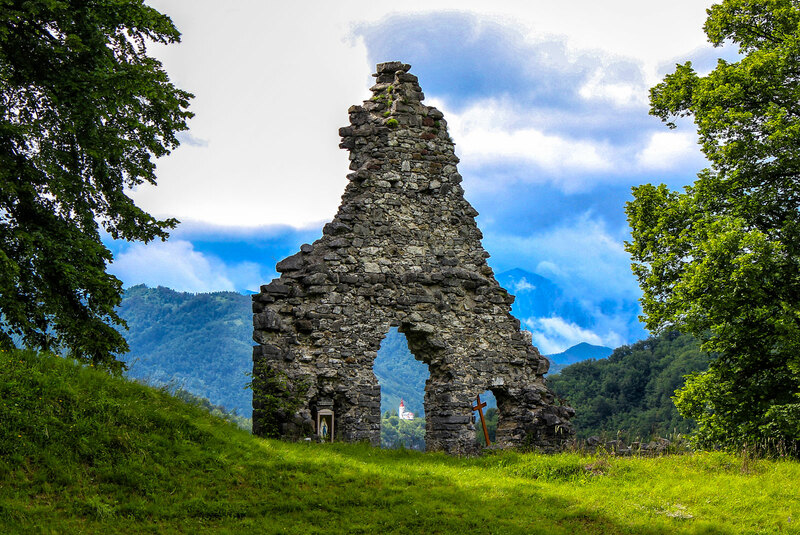 And lastly, the prehistoric archaeological site of Divje Babe is located right above the river bed of Idrijca or – if seen from the other side – below the Church of St. John the Baptist. It’s certain that the pentagram marked by the churches isn’t a coincidence. What purpose it had and many other questions arising from this will have to wait for new research. It might also happen that they will forever stay wrapped in a veil of mystery. ∙ Mohorič, I. (1994). V zvezdi piše vse: priročnik za prostozidarske mojstre. [Everything is Written in the Star: A Manual for Master Freemasons]. Idrija: Založba Bogataj.